The word “Charterer” is probably as old as the word “Ship” itself. Do you keep hearing this word so regularly? 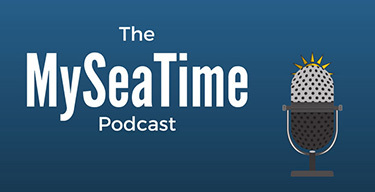 From seafarer’s point of view, it is so much important to understand these terms. From commercial point of view, it is the moral responsibility of the seafarers to ensure that the ship owner profits from the ship operation. And for this reason, we must understand when and where our loyalties lies. But sometimes it becomes difficult to get a hang of all of it. In this blog, we will discuss about the terms charterer and charter party agreement. And like in all kind of business, there are at least two parties involved, one of which provide a service or product to the other for a price. 1) Ship owner who has the ship and provide the space on the ship to carry the cargo. Then where does the term charterer fits into this? Charterer is the party that has chartered (think of simple word “hired”) the ship. If the shipper has chartered the entire ship then shipper will also be the charterer. This is particularly the case if there are more than one shippers. For example, if the vessel is to load 50000 tons of cargo, there could be 10 shipper, say each of them with 5000 tons of cargo. Alone none of the shipper would want to hire the entire vessel of 50000 tons capacity for their 5000 tons of cargo. So they contact a charterer for transporting their cargo. The charterer’s job is to find a vessel for the cargoes they have from different shippers and maximazing the space on ship they plan to hire. Charterers may not be the only person involved in filling the gap between shipowner and shipper. Sometime there are some other companies or persons who help shipper, charterer and shipowner to connect with each other for a fees. So the shipper’s broker is the person or company that help shipper find a charterer for a fees called brokerage. And charterer’s broker is the person that help charterer find a ship to hire. The charterer may even have brokers for different purpose. 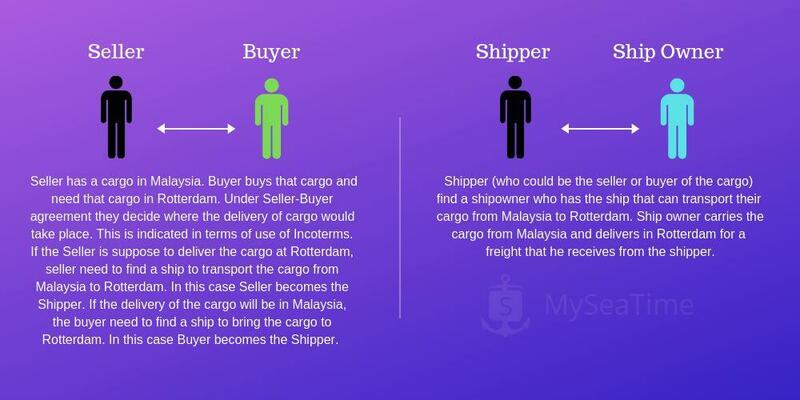 For example charterer may have a broker to find a cargo for the ship they want to hire and they may have another broker to find a ship for the cargo they have in hand. 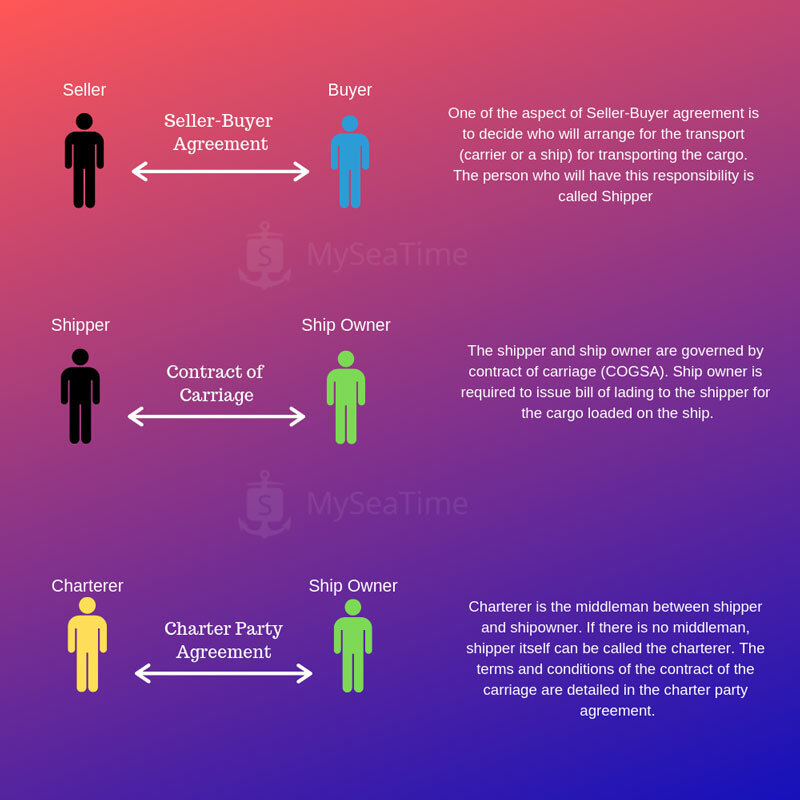 Broker or no broker, the charterer and shipowner would agree on the terms and conditions which would form “Charter party agreement“. Even though shipowners is primarily dealing with the charterer, it does not mean that the shipowner would have no relation with the shipper. 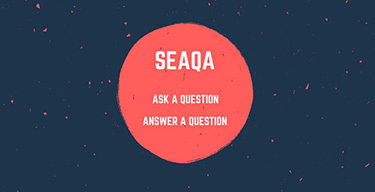 Shipper and shipowner are connected by the “carriage of cargo at sea act”, also called COGSA. And one of the main point of it is that shipowner is required to issue bill of lading to the shipper for the cargo loaded onboard. And with that each of the shipper have entered into an agreement with the ship owner which is called “Contract of carriage”. While the “charter party agreement” is a formal agreement, the contract of carriage is governed by various laws and regulations such as Hague-Visby rule. Charter party agreement supplement the contract of carriage. Usually you would find a mention of the charter party agreement in the bill of lading. The wording in the bill of lading could be something like this. This shipment is carried pursuant to charter party agreement between “Charterer’s name” and “Carrier’s name” and all the terms, clauses, conditions, liberties and exceptions whatsoever contained therein are incorporated into this bill of lading. But do the shipowners and charterers do this exercise of negotiating the format of the charter party agreement each time they do the business together. Absolutely not. Hell, it would take a lot of time. Instead they use pre-defined forms. 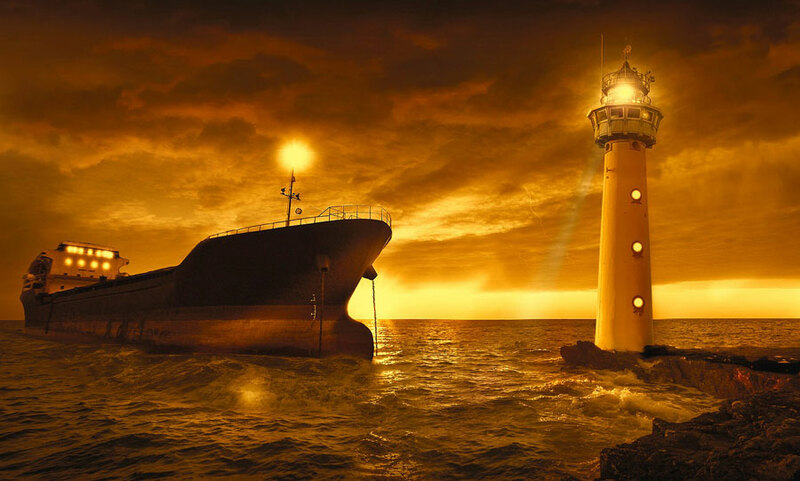 These forms are developed by Independent International stakeholders such as BIMCO and INTERTANKO and are widely used in the shipping business. There are different forms for different trades. For example there is form SHELLVOY 6 for use in tanker trade and then there is form AMWELSH 93 for coal dry cargo chartering. Also if a charterer and ship owner have done the business before, they use the same charter party agreement for the future shipments too. 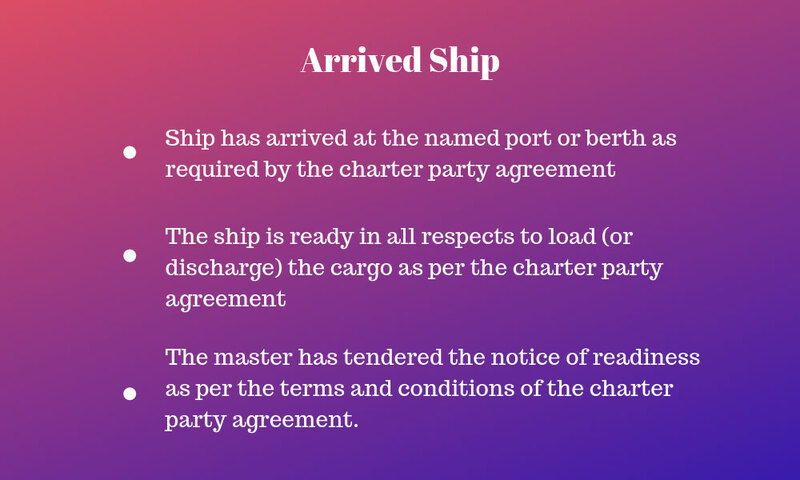 The shipment is carried pursuant to charter party agreement between “Charterer’s name” and “Carrier’s name” dated 01 January 2016…..
Now that we understand the concept of chartering, let us understand the different ways in which the ships can be chartered. There are different ways in which a charterer can charter (Hire) the vessel. Charterer can charter the vessel for one voyage (Voyage charter), for a particular time period (time charter) or they can hire and run the vessel as if they are the owner of the vessel (Demise or bareboat charter). 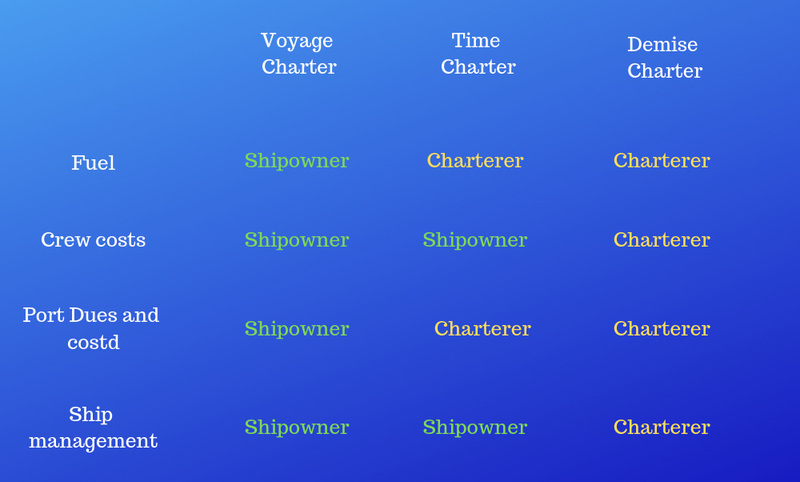 In each type of charter, charterers and shipowners have different area of responsibilities. Each type of charter is a subject in itself. So in this blog we will explore the voyage charter. It should be clear from the name. Under the voyage charter, the ship is hired from the ship owner for one voyage. One voyage could consists of multiple load ports and multiple discharge port. The best analogy to the term voyage charter is that with hiring an Uber for a ride from one place to the other, sometimes with multiple stops in between. So when we hire an Uber, we hire just the cab. The cab driver is still under the instructions of Uber. Similarly, under the voyage charter, the charterer has hired the ship’s cargo space. But the Master and crew still remains under the disposal and instructions of ship owner and ship managers. When we hire a cab for a ride, we just pay the hire (pre-agreed or by the meter). We do not pay for or are not concerned about the fuel costs or the amount of fuel consumed. Similarly, under the voyage charter, charterer is not concerned about the fuel consumption. The fuel costs are for the ship owners. And when we hire an Uber, we do not pay for maintenance of the cab. Similarly, under the voyage charter it is the ship owner who pays for the maintenance of the ship. Whenever we have any doubt about anything under voyage charter, just think of this analogy of hiring the cab. Most likely you will get the answer. Lord Diplock during one of the leading cases on Laytime described the voyage charter party comprising of four stages. Stage 3 is the carrying voyage: The voyage from load port to the discharge port specified in the voyage charter party. 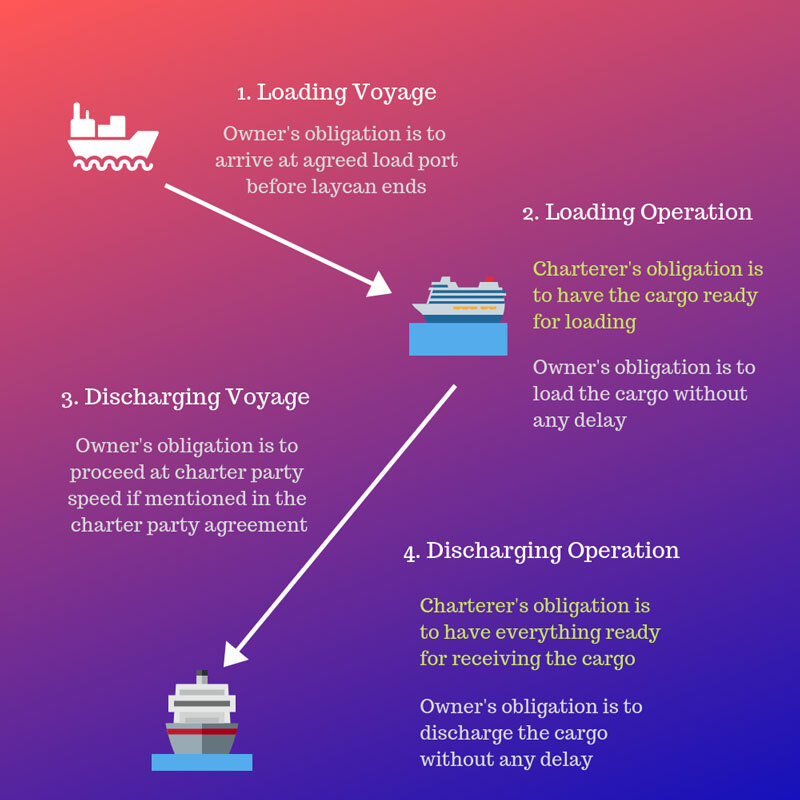 Stage 4 is the discharging operation: The discharging of the cargo from the ship to the port of discharging as specified in the voyage charter party. In the first and third stage, it is only the ship owner that need to perform. For example. ship owner is required to adjust the speed of the ship to arrive at the loading port within the agreed dates (Laycan). And in the third stage, the ship owner is required to instruct the vessel to maintain the charter party speed. However it is the second and fourth stage where most of the disputes take place. Because in these two stages it is mutual reponsibility of the two parties to ensure that cargo loading and discharging is done without any delays. In case of delays, each one can accuse the other for delays. It is definately not commercially profiting for the shipowner if the voyage is extended beyond their expectations. 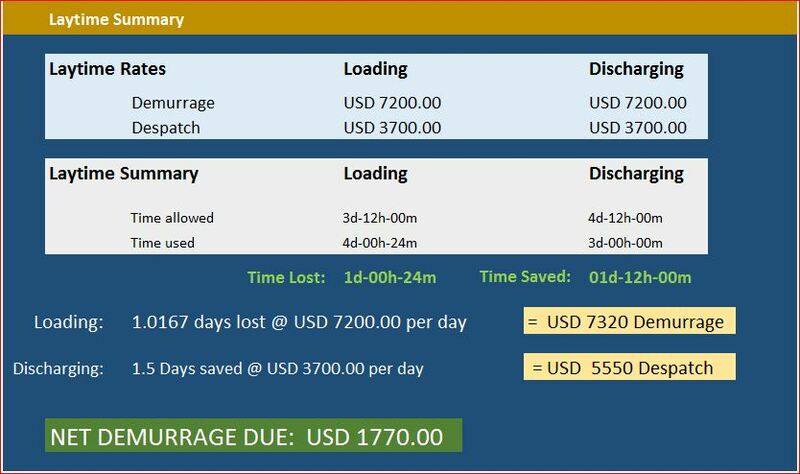 For example, what if the loading of the cargo took 15 days in comparison to just 2 days that shipowner had expected? Or what if the ship could not berth at load port or discharge port for many days because of other ships ahead in line up? But ship owner’s freight (and profits) cannot depend upon so many uncertainties. So the shipowner and charterers agree on the factors like allowed number of days for loading and discharging. In chartering terms this is called “Laydays” or “Laytime”. 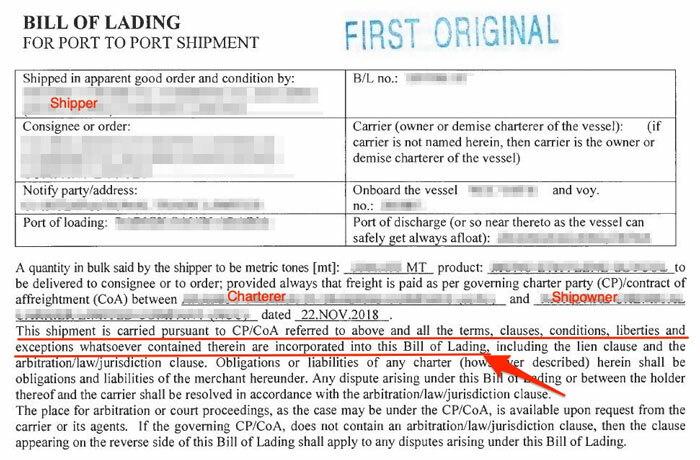 The laydays is mentioned in the voyage charter party agreement between ship owner and charterer. It could be mentioned as number of days and hours or as tons per hours or per day. 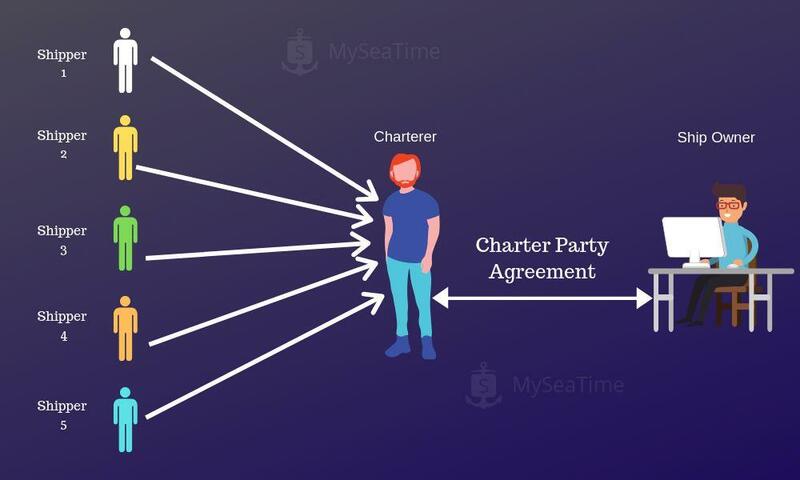 If the charterer uses more time for loading and discharging than the allowed laydays as per charter party agreement, then charterer is supposed to pay for extra time used. The chartering term for this additional payment is “Demurrage”. 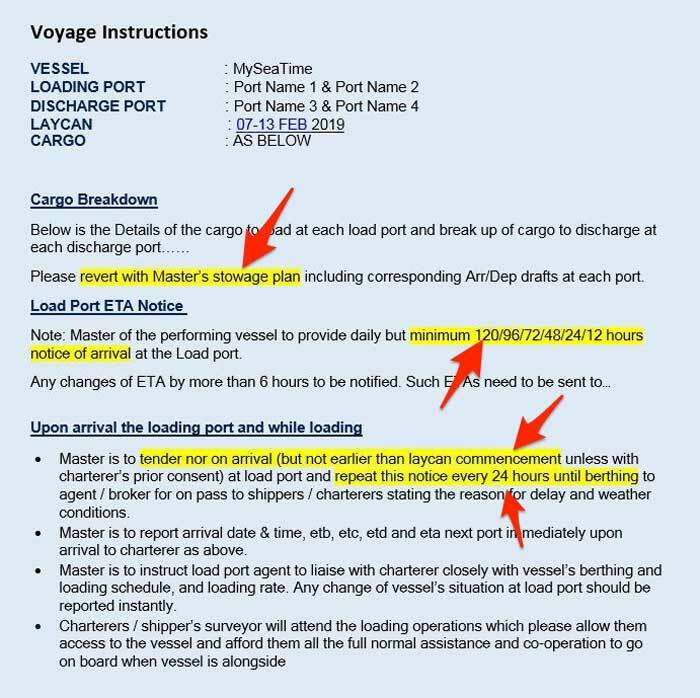 So we can say that if charterer uses more time for loading/discharging than laydays, they need to pay demurrage to the ship owner. But if the charterer uses less time than laydays then ship owner need to pay the charterer for the time saved. The chartering term for this is “despatch”. Usually the agreed amount of despatch is about half of the agreed amount for demurrage. Finally at the end of the voyage, a statement is made to shows the time saved and/or extra time taken at different ports. Below is the simplified version of the laytime summary calculated at the end of the voyage. This statement would also show the final amount due and to whom it is due. Means if the final amount is demurrage or despatch and how much. For calculation of laytime, it is important to know when the laytime counting and calculation would start. This information is also provided in the charter party agreement. In most of the cases, the laytime would commence to start when the vessel has arrived at the port. In chartering term, this is called “Arrived Ship“. Ship has arrived at the port of loading or discharging (port voyage charter) or at the designated berth (Berth Voyage charter). The charter party agreement contains the information if the voyage charter is a port voyage charter or a berth voyage charter. Irrespective if it is port or berth voyage charter, from the ship’s point of view it is important that the master of the vessel send the notice of readiness. Notice of readiness need to state that the vessel has arrived and she is ready in all respect to commence loading (or discharging ) of the cargo. The laytime would start to commence at this time or sometimes few hours later if specifically mentioned in the charter party agreement. Since one of the condition for the laytime to start is for the master to send the notice of readiness, it makes it so much of an important aspect. The vessel and the master of the ship are the owner’s representative at the action site (loading port or discharging port). Ship Owner would know only know the information that we provide them. They would use this information for calculation of any demurrage due to the charterers. But for the correct demurrage calculation, the information we provide must be correct and we must not miss any important information such as any delays. That make the statement of facts (commonly called SOF) an important document. Master and ship staff may not see the actual charter party agreement between the charterer and the ship owner. And it is for their own benefit too. Because there would be so many things in that which we seafarers are not concerned about. But when the ship is fixed for the voyage charter, master will receive “Voyage instructions” from the charterer through the ship owner’s commercial team. The voyage instructions contains the information from the charter party agreement that requires master’s attenstion and subsequent actions. Master must not miss the points in the voyage orders that requires his actions. One of the way to do it is to highlight the text of the voyage instructions that require his attention for easy follow up. Once Master reads the voyage instructions, he may come across insufficient information that need more information or clarification. Like this one in one of the voyage orders. 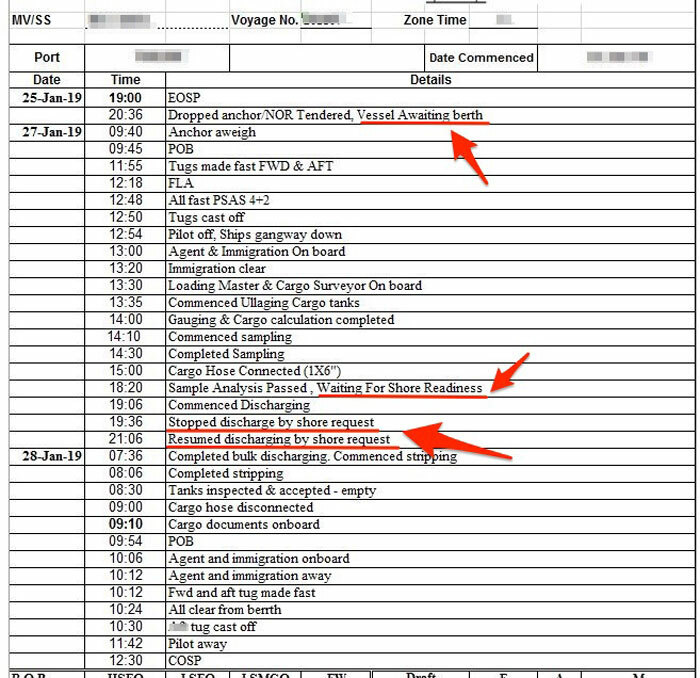 Clarification must be sought from the ship operator for any of such information in the voyage orders. After all it just takes a simple email to get everything in place. And once everything is clear and in place, it is just about following that. There are may be only a handful of shipowners that do not rely on the charterer to find the cargo for their vessel. Having the vessel on charter is so common. And vessel can be chartered in different ways. Vessel can be on a voyage charter, time charter or demise/bareboat charter. First, when is the laycan for the vessel. This is period in which vessel must arrive at the load port. If master thinks that vessel may not be able to make it to the loadport in laycan period, the commercial operator must be informed who can then try to extend the laycan. Second, when the notice of readiness need to be tendered. If the voyage charter is a port charter, NOR can only be tendered when vessel is at least within the port limits. Usually in this case NOR is tendered when pilot boards the vessel. If the voyage charter is berth charter, the NOR can only be tendered when the vessel is alongside the designated berth. Wrong tendering of NOR can make the Notice of readiness null and void and shipowner may loose tons of money. Lastly, the ship staff need to be make sure that a correct record of statement of facts is kept. This is the document that is used for laytime calculations. If the charterer uses more time than agreed for loading or discharging the cargo, the ship owner is supposed to get a pre-agreed compensation called demurrage. Capt. Rajeev Jassal has sailed for over 20 years mainly on crude oil, product and chemical tankers. He holds MBA in shipping & Logistics degree from London. He has done extensive research on quantitatively measuring Safety culture onboard and safety climate ashore which he believes is the most important element for safer shipping. How i wish that our exam books were written so precisely yet so easy to understand .Thanx for all the pain you take .No amount of words would do justice to match the level of you efforts. Another good read. Thank you for taking time to write articles. All Seafarers must understand the commercial aspects of ships. All the best and I cant wait to read the next one. what if the ship could not berth at load port or discharge port for many days because of other ships ahead in line up?Too many uncertainties.But ship owner’s freight (and profits) cannot depend upon so many uncertainties.So the shipowner and charterers agree on the factors like allowed number of days for loading and discharging.In chartering terms this is called “Laydays” or “Laytime” ??? Laydays refer to the time when a ship must present itself to the charter.If the vessel arrives after the laydays ,than contract can be cancelled. -Laycan. 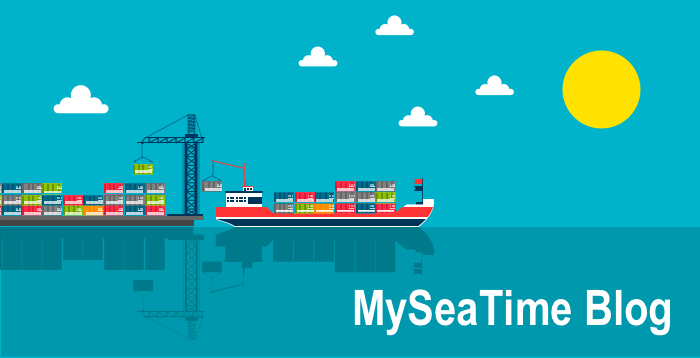 Laytime is the amount of time allowed (in hours and days)in a voyage charter for the loading and unloading of cargo. Thanks for such simplified explanations. Sir could you please tell the few famous ship brokers names in india and worldwide. Thank Captain for simple & detailed explanation. Information is really worthy . Thanks Capt. Rajeev for this good information in simple way. This is a scholarly article Great job Captain! Good job, Capt. Jassal! These mandatory intricacies of ship's business & chartering are excellently presented. Organized and laid out as you have, this blog subject does a great service to anyone who longs to learn more about it & be more familiar with the clauses, details & positions (which is probably everyone, right?) -- including this marine cargo surveyor!